I recently had the chance to visit Tonnellerie de Mercurey, a leading barrel manufacturer in Burgundy. Barrels are pretty important to wine, because even though they are an old technology, they are still widely used, especially for more premium styles, and have a strong influence on the flavour of the wine produced. If you’ve ever tasted through barrels in cellars, you will know that the same batch of wine will taste quite different depending on the barrel they are being aged in. There’s the age of the barrel, the source of the oak, the size of the barrel, and the way that the barrel was produced (for example, how it was heated to bend the staves) – all these factors influence the way the wine tastes. 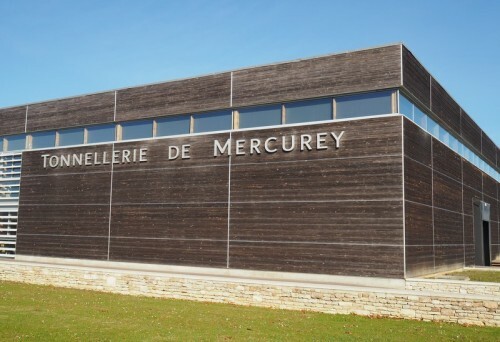 Tonnellerie Mercurey deal exclusively with French oak. The other widely used sources of oak are American (which delivers more sweet oak flavour) and eastern European (these barrels make the wine taste quite savoury and spicy). Mercurey own their own stave mill, which processes the trees and produces staves. This was where their business began, with staves and forestry, and they still sell staves to other cooperages. The Tonnellerie, where they use their own wood to make barrels, is a more recent development, and began in 1992. It has expanded quite a bit, and they moved into the factory we visited in 2009. Currently, they make 16 000 barrels a year, which works out about 80 per day. The staves arrive here pre-cut. One of the specialities here is that each barrel is made of blends of staves from different origin wood. They also have some barrels that are made from specific terroirs: for example, oak trees grown on more rocky soils show more heterogeneity in the staves, with some having a wider grain than others. It’s interesting that terroir affects the way that oak grows and that this in turn will affect the properties of the barrels. Generally speaking, tighter grain is better, and produces higher quality barrels that impart less character to the wine, but which are suited to long ageing of wine in barrel. Staves must be split, not sawn, when French oak is used, or else the barrels would leak. 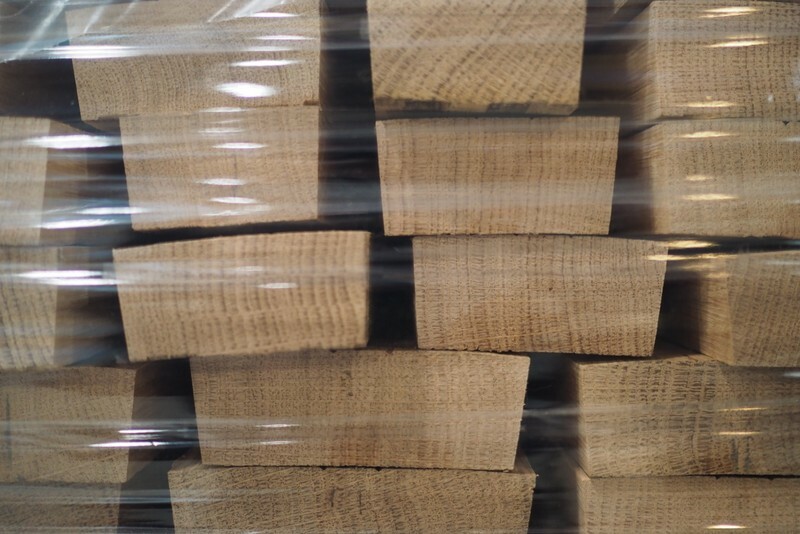 American oak can be sawn, which is one reason that American oak barrels are cheaper. They are stored outside to season for two or three years. They get rained on, and this leaches out the bitter green notes that would otherwise make the wine taste horrible. They are then planed into shape. The staves arrived stacked on pallets, and chalk marks indicate where one barrel ends and another starts. The first stage in barrel assembly is to take them and arrange them in a metal hoop, a job that looks easy, but which requires skill and experience. The ring holds the base of the staves close together, and then a wire pulls the top of the staves in a bit so another, wider hoop can be placed at the other end, beginning to form the barrel shape. Then further temporary hoops are placed on the barrel and banged into place, drawing the staves closer together. The barrel is then ready to go to the most dramatic bit of the factory, where it is fired. The barrel is placed over a small burner, where the heat of the flame begins to soften the wood a bit, making it flexible enough for the staves to be brought properly together and the shape of the barrel formed. It’s then moved a short distance to another area where here the flames are used to provide the right degree of toasting of the inside of the staves. The degree of toasting is specified by the customer, and can range from light (the barrel smells of bread and toast flavours when you put your nose in) to very heavy (here, the barrel smells of chocolate and coffee). The next stage involves sanding the ends of the barrel and carving the slot inside the rim (the croze), in order for the heads to fit into nicely. After these are cut the grooves are filled using a sawdust flour paste, so that when the ends are fitted, they form a watertight seal. A barrel hole is also cut into one of the staves. There are two ways of making the barrel heads. The first is to take flat staves and then cut tongues and grooves in the sides. These are then joined together to form a tight seal. The other is to take flat staves and join them using a combination of dowels and reeds. After this, they are cut into circles and planed so that they fit nicely into the grooves around the inside rim of the barrel. After the ends have been fitted, two permanent barrel loops are added, one at each end, and hammered into place. The barrels are then tested to see whether they are watertight, by putting warm water in at pressure and then moving the barrel around on some rollers. Once they pass this test, the temporary hoops are removed, they wood is sanded down so it looks nice, and the other permanent hoops are added. The barrel is checked, and then it is branded at one end, with the name of the cooperage and in many cases, the customer’s own name or logo, plus details about the toasting level and the origin of the wood. A 225/228 litre barrel is expensive, at around 800 Euros, but it’s a thing of beauty, made of high quality oak, and it will last a few years. It would be hard to imagine fine wine production without oak barrels, even though now more people are experimenting with alternatives such as large casks, concrete eggs and tanks, and terracotta amphorae. Is UK sparkling wine heading for a glut?